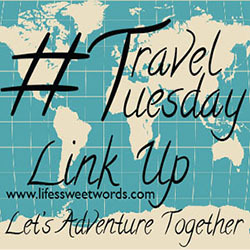 Can't wait to see where everyone has been traveling (linkup at bottom of post)! 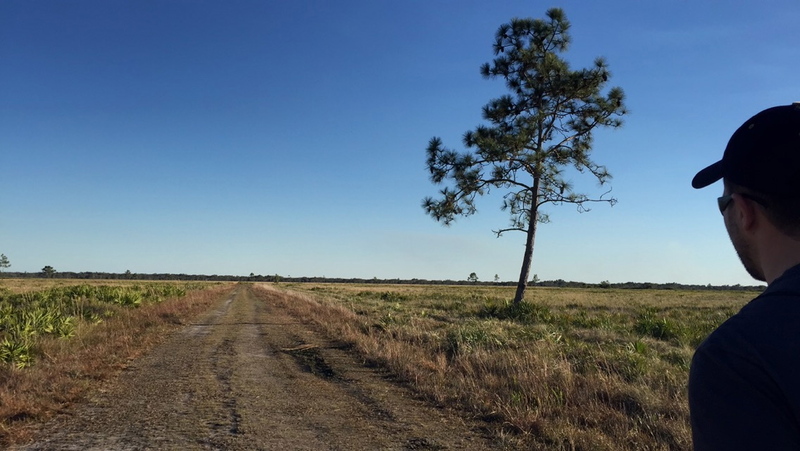 Three Lake Wildlife Management Area is located off of N. Canoe Creek Rd. in Kenansville, FL and the hunters loop where we stayed was about two miles before (coming from Orlando) the main entrance to the WMA. Pay close attention as you're driving, because you can get lost in the beauty of unspoiled Florida and miss the turn (like we did!). We had a hard time finding a spot to turn around with Flo attached. There will be a big green sign and other trailers parked, so just look out for those. We originally drove in to the Three Lake WMA entrance looking for a place to camp there. 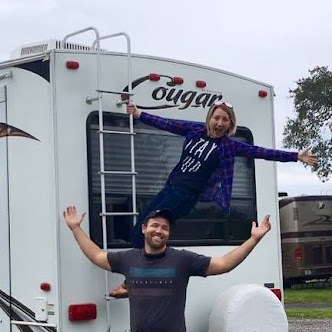 While the spots seemed plenty big enough for an RV, that part is tent only! So if you are RVing it has to be the hunting loop. There is plenty of space to spread out and you just find your own spot! It wasn't too crowded as there was no active hunting season, but there were still quite a few travelers escaping winter weather who had been there quite a few weeks and we still had plenty of space for our own private spot! The other RVers were all very sweet and invited us to the potlucks and happy hours that they arrange with others who had been staying for the winter. We just had to pass since we were out hiking! *Note on dumping: There is no dump station at the loop. We heard that you can use the one at the RV park about 10 miles down the road (heading right leaving the loop) for about $10. We weren't heading that way, so we thought we would try the RV park we had seen on our way in. However, the office was closed on Sunday. We ended up going by Moss Park on our way back into Orlando and we were able to use theirs for $5!! Hiking! Lots and lots of hiking! The trails were very wet this time of year, but in my opinion that only adds to the adventure! The first night we got there we just went out from where we parked Flo. We walked to the back of the loop, where the road continues out into the expansive prairie that I assume is where the hunting takes place. I wouldn't recommend hiking there during active hunting season, just to be safe. For that hike we were pretty much just walking the road, though we did find a couple of beautiful cut through trails! This space would also make a beautiful drive if you wanted to take it easy one day. The roads were still accessible by car for those looking to make the drive to the lake to fish. On Saturday, we woke up and spent a gloriously lazy morning drinking coffee made over the fire and then geared up for our day in the main hiking area of Three Lakes WMA/ Prairie Lake Unit. A portion of the Florida Trail runs through this part of the WMA and there are two 6 mile loops to choose from, along with a few short out and back trails that run to the lake. We saw quite a few people fishing along the river that can be reached from the road. There is also a public boat ramp. Our hike was beautiful!! We hiked in so many different landscapes on our loop. We choose the 6 mile loop that included the FIRE TOWER, which is best reached by parking at the information sign when you first enter the WMA. The trail starts right there. We crossed the road and started the loop that way, so that we came out at the side where the car was at. The fire tower is located maybe a quarter of the way in. Climb it!! Seriously amazing views!! And such a rush!! (Unfortunately the tower is not actually climbable. 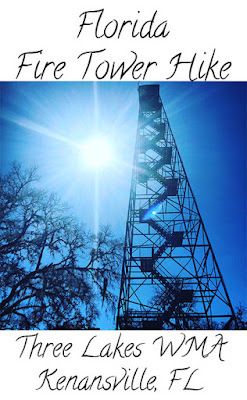 I was alerted by park staff, in a comment, that the tower was not actually meant to be open for climbing and that it poses a safety hazard and will typically be locked. Sorry :/ I am glad we got to climb it, but don't want people to plan to head that way in the future hoping to go up!) You can see some of the fun in the video! The trail also included hiking through pine flats, open prairies, shaded spots along the river, quite a few ankle deep water spots, and a boardwalk through marshland! There is a section where the first 6 mile loop bypasses a connector to the other 6 mile loop. So, if you are early morning hikers preparing for a full day, there is always the ability to do both! Across Canoe Creek Road, as you leave the WMA, the Florida trail continues for through hikers. After finishing our loop we crossed the road and walked a small portion of this trail. The trail was definitely less maintained than the trails in the WMA. Babe loved it because he felt like he was forging the trail! We were definitely bushwhacking through some of it and, in certain spots, it was hard to tell if you were actually still on the trail, but it was still a lot of fun. We went in maybe a mile or so before turning back! 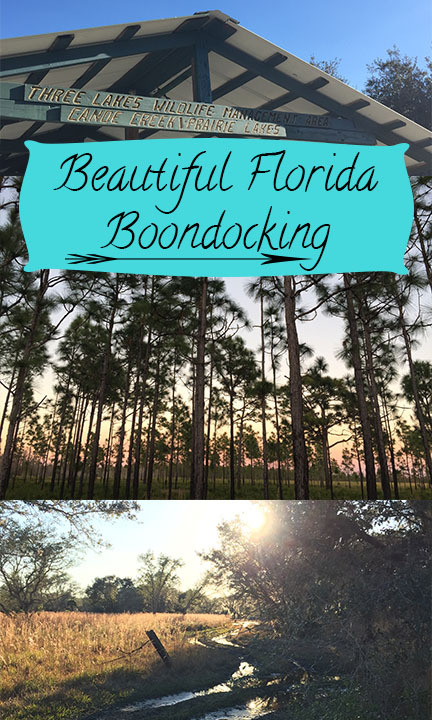 Overall, this entire location was a beautiful spot for some Florida hiking! Each night we wrapped up our day by the fire, playing our endless game of Rummy (not to toot my own horn, but it's seldom that I am winning at anything over him, so I just had to share the current score// Me: 10,020 Babe: 9,760)! Though there weren't actual fire pits at the loop, people had made their own and we did the same. The ground was so wet that we didn't really even have to dig. We just made a circle in the dirt with stick and then built a ring in the middle of the ring. The fire burned, but never even reached the perimeter of our circle. Anytime flames would shoot out and heat the ground outside the ring they would immediately burn out! If you go bring plenty of wood and make yourself nice and toasty! Though we really just ate while we were hiking (lobster and burgers on the travel grill! Our go to camping happies! ), I thought it was noteworthy to share the BBQ joint Babe introduced me to on the way through St. Cloud on our way on Friday. Fat Boy's BBQ is off the chain!! Seriously, Florida friends?! Florida travelers?! You have to try it! Babe use to go all the time apparently back when he was mowing county roads and they had a contract near there. I can't believe he hadn't taken me before! They have been there forever and I don't think the menu has ever changed! The prices are low, the portions are high and the food is YUMazing!! The atmosphere is awesome too! Wood paneled walls lead into a dining room style open room, with a fireplace along the the back wall!! If you love BBQ, you have to give it a try! There's even an old wooden rocking horse at checkout that's perfect for even the biggest of "kids"! And that was our most recent Florida adventure!! We had an amazing time and I can't wait to go back and give boon-docking another try- though maybe this time with some solar panels or a generator! Where have you been adventuring too recently?! 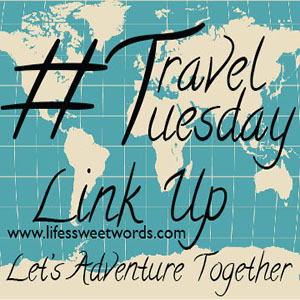 Linkup and let's travel together! Haha, thanks! And the rocking horse would definitely be a hit! Hiking can be tough, but I take my 4 year old niece sometimes and she loves it! We don't do long trails when we take her though. Just enough to do down a little bit, pick up some sticks, look at funny plants and breathe in the fresh air! You bet :) Thanks for joining in on the fun! it looks like a fun time, I really like the pictures of your hike! This looks like such a beautiful place to visit! I have never been to Fl..it is on my bucket list! thanks for sharing! Looks like some good outdoors time! I love those old-school southern BBQ restaurants that never seem to change with the passing of time! They really are the best :) So yummy!! Fun! I am a sucker for a beautiful sunset. 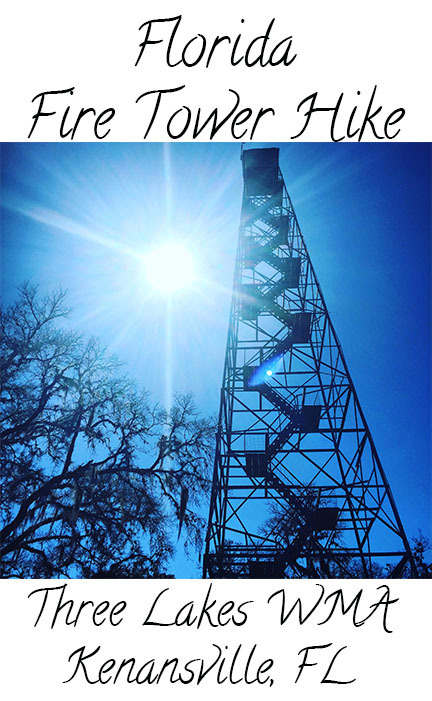 The fire tower in Three Lakes is not for public access. It is a liability and safety hazard for the public and should only be accessed by FWC personnel. Unfortunately the lock was rusted and not functioning properly but has been replaced. Please advise your readers. Thanks. Thank you for letting me know about this, I will update the post!